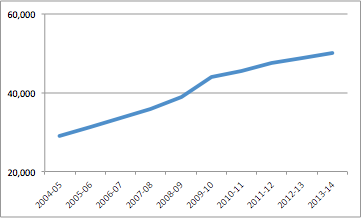 Victorian Public Sector (VPS) spending has doubled in the past 10 years, according to the ABS. This comes at a time when other industries are learning how to do more, not by allocating additional resources, but by embracing emerging technologies and business models to do more with less. World class education can now be accessed in remote areas all over the globe, often for free, using massive open online courses, or MOOCs, such as Khan Academy and Coursera. The cost to serve of these organisations is significantly lower than that of say, a University. We are now paying less than ever to communicate with people in not only the next postcode, but the next country code too. We are capable of having free real-time video calls with people on the other side of the world using platforms such as Skype. The real cost per mile for air travel has halved in the past quarter century and business model innovation means has made international air travel more affordable than ever. My last return trip to Singapore from Melbourne cost me under $400, whereas a similar trip 20 years ago would have cost me well over $1,500. It’s not always about technology but about how a business model shift such as no frills airlines, can support additional aircraft turnover and subsequently lower cost per seat. Companies like Uber are not only offering a cheaper and more enjoyable experience than cabs, but their cost to serve is significantly lower than that of a traditional taxi network, given that they don’t own any of the Ubers on the road. The same can be said of Airbnb whose market capitalisation of US$25B is larger than that of the Starwood, the Marriott and the Hilton, despite not actuallyowning a single property. While new, emerging technologies and business models are enabling many enterprise companies to deliver more with less, the same can’t be said of our public sector. Government, like enterprise, can essentially innovate on three fronts. However, like enterprise, it faces numerous barriers to innovation. Government has been built to deliver a reliable and repeatable operating model. It has not been built to search for new operating models, which requires a different approach and is normally the domain of newly formed ventures and startups. What prevents Government’s ability to search for new operating models? A combination of values, processes, systems and resource allocation procedures prevent Government from adopting the behaviours and mindsets required to effectively support innovation. Most of these are in place to mitigate risk more than anything. Of course, Government can’t just “move fast and break things”, as was the Facebook mantra in their early days, so it must take a different approach if it is to become more efficient at spending taxpayer money to ultimately derive maximum benefit for all. This is essentially what emerging customer-centric tools and methodologies such as design thinking, lean startup and agile support. So, what can Government do to overcome these barriers? Government can implement idea platforms such as Crowdicity or Spigit to solicit opportunities, challenges and ideas from not only their employees but also their partners, suppliers and perhaps most importantly, constituents or members of the general public. The United States has been running its Open Data initiative forunder three years and in that time has co-developed almost 100 applications to help achieve its mission which includes cost savings, efficiency, improved public services, fuel for business and transparency. When looking to work with SMEs, startups and members of the general public, it’s critical that procurement processes align with the reality of these businesses. Most small organisations don’t have the time or resources to invest in the often painstaking process of winning a Government contract. They are cash flow driven and simply can’t afford to over-invest limited resources where the payoff is unlikely to come through. Existing procurement processes have been implemented to ensure probity and minimise risk. However, when we’re looking to do discover new operating models then limiting ourselves to these standards usually results in not only cutting out most of the emerging and disruptive players, their talent and technologies. but engaging large incumbents who are likely to pass on large fees in order to keep hitting their growth targets. Traditional product development processes such as waterfall and stagegate, like procurement processes, are geared towards mitigating risk and maximising certainty. However, when looking to discover new operating models, lower the cost to serve and transform the way Government fulfills its mission, there are too many unknowns and methods that rely on variables being known simply don’t work. In such instances we need to be embracing iterative, discovery driven development in order to maximise benefits realisation and spend of taxpayer funds. How does one do this in a Government that is fraught with red tape, requires multiple sign-offs and simply can’t move quick enough to reap the rewards of a fast-paced, iterative product development process that builds on the build-measure-learn feedback loop set out by Eric Ries in the lean startup? Hackathons and innovation bootcamps help provide some relief. They bring together cross-functional and cross-hierarchical teams for anywhere between one day and one week to apply design thinking and lean startup methods to gather insights, define problems, ideate solutions, develop prototypes and test their prototypes with constituents. Essentially many ideas can be tested in a short frame of time which means that in a short space of time, with minimal outlay, we can help to determine where capital should be allocated. It’s important to engage outsiders during these hackathons who will bring unique perspectives to the process and therefore help craft more novel solutions. Think partners, suppliers, constituents, designers, developers, marketers, technologists, innovators and strategists. Business incubators have birthed some of the world’s most notable modern companies — think Airbnb, Reddit, Dropbox, Uber and Spotify. Y Combinator, 500 Startups and Techstars are just three of thousands of incubators developing tomorrow’s Fortune 500. The latter has also worked extensively with enterprise organisations such as Barclays, Disney, Nike and numerous others to help incubate new business ideas and technologies in a safe to fail, fast moving environment away from the bureaucracy of the mothership. 18F is essentially the United States’ incubator. It is a team of people working on all sorts of new, disruptive ideas geared towards their mission of ‘building the 21st century digital government’. When it comes to innovation in Government, as in large enterprise, there is no silver bullet, and only by doing can we identify all of the major roadblocks, be they people, process or technology, that inhibit innovation. With a clear picture of what these roadblocks are we are better placed to break them down and find ways to support the behaviours required to innovate, withoutcompromising the existing delivery of services. If our answer to every problem is simply to throw more money at it, we will find that our cost to serve continues to skyrocket, without having a noticeable benefit on the quality of service. By embracing emerging technologies and exploring operational model innovation, Government can do more with less. This will help to bolster Government, increase the pool of funding available for economic development and make room to decrease the pinch that taxpayers feel each year.